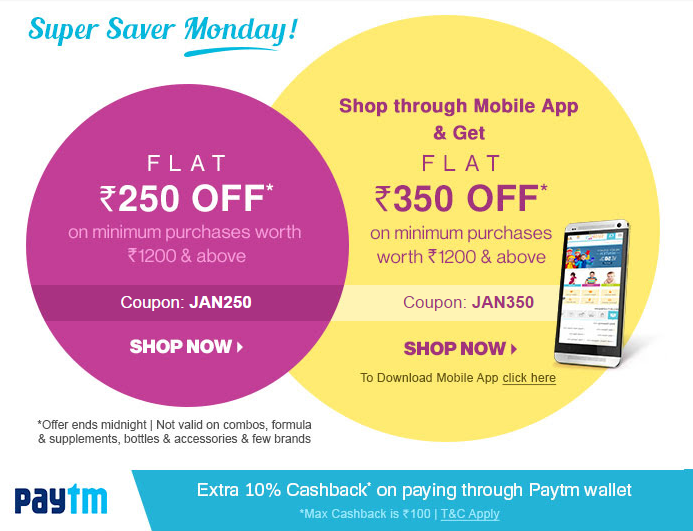 Firstcry has come up with Super Save Monday offer today. Offer ends midnight today, ie Jan 11-2016. Get Flat Rs.250 off when you make a purchase worth Rs.1200 and above. Use coupon code 'JAN250'. Get Flat Rs.350 off when you make a purchase worth Rs.1200 and above in FirstCry App. Use coupon code 'JAN350'. Also, get extra 10% cashback when you pay your FirstCry order through Paytm Wallet. Maximum cashback is Rs.100. The offer is not valid on combos, formulas and supplements, bottles and accessories and few brands.